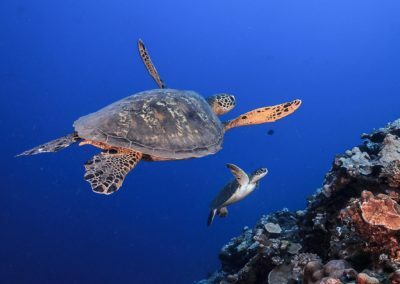 The Hawksbill turtle is a species often confused with the green turtle. The hawksbill turtle is smaller than the green turtle measuring from 23 to 39 inches and weighing from 95 to 165 Lbs at adulthood. Its scientific name is Eretmochelys imbricate and has a relatively flat bony brownish-colored shell. This shell is composed of thick scales resembling the overlapping shingles of houses. We can identify a line of 5 scales on the central axis and 4 pairs on each side. On the belly side, its shield abdomen is a pale yellow color. The hawksbill turtle’s shell is heart-shaped at birth growing into an oval shape as it grows to maturity. 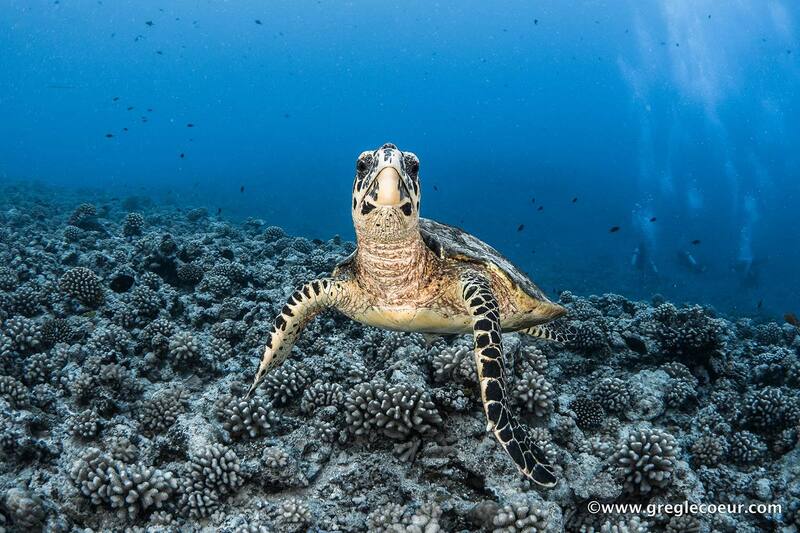 The Hawksbill turtle frequents warm tropical waters. It lives near the coral reef as deep as 230ft. True to its name, the Hawksbill turtle displays a prominent bill resembling that of a hawk. This bill allows the turtle to bite at almost anything that crosses its path…watch your fingers! Its front fins have two claws. These claws are much longer in the males to assist latching on to the females during reproduction. 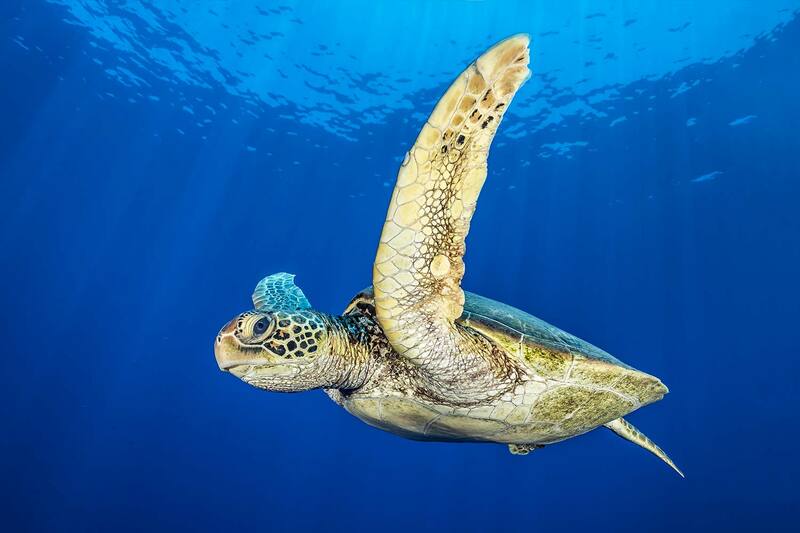 In addition, the Hawksbill turtle can be distinguished from the Green turtle by its 4 prefrontal scales on the head. 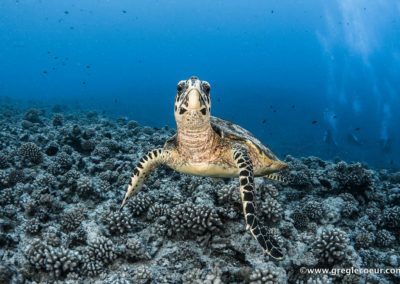 The Hawksbill turtle frequents warm tropical waters. It lives near the coral reef as deep as 230ft. At a certain time, this turtle species migrates according to the season to reach its secret nesting sites and feeding grounds. The turtle seems to be guided by the earth’s magnetic fields for its migrations. It may reach a speed of 24km/h for this large moving. It becomes sexually mature around 20 to 30 years. Then it returns to its birth place every two to three years and lays about 50 eggs 2 to 3 times during the season. The turtle’s laying season lasts around 6 months. The scientists estimate that only two per cent of young turtles will reach adulthood. 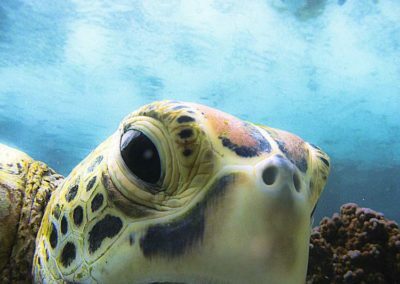 Strangely enough, turtles have developed an incredible propensity to beat the odds: all females have the ability to keep “in utero” reserves of sperm to reproduce themselves for many years without encountering males. 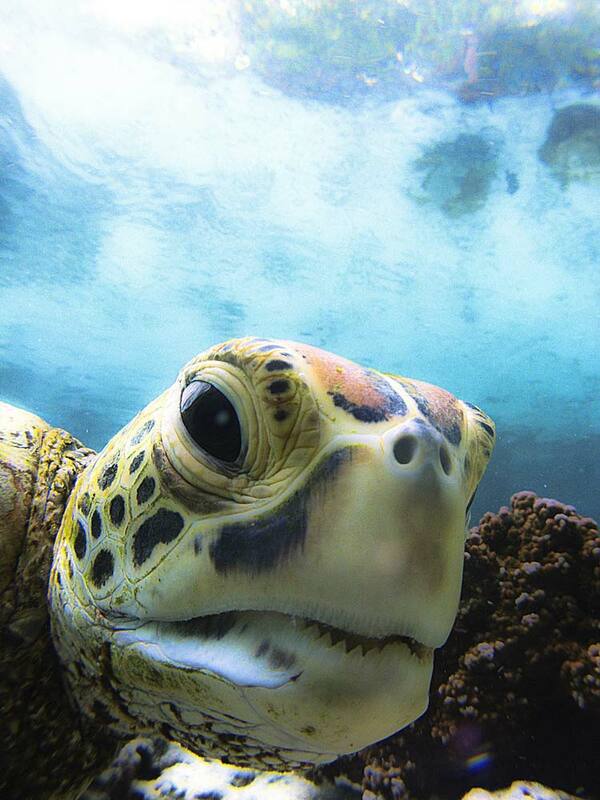 The hawksbill turtle feeds on small fish, crustaceans, jellyfish and others mollusks. But its favorite food are the sea sponges that they can graze on all day long. Its natural predators are the Tiger shark, the Bull shark most recently, man. Luckily today, man is now more focused on its preservation since the turtle has been on the endangered species list. 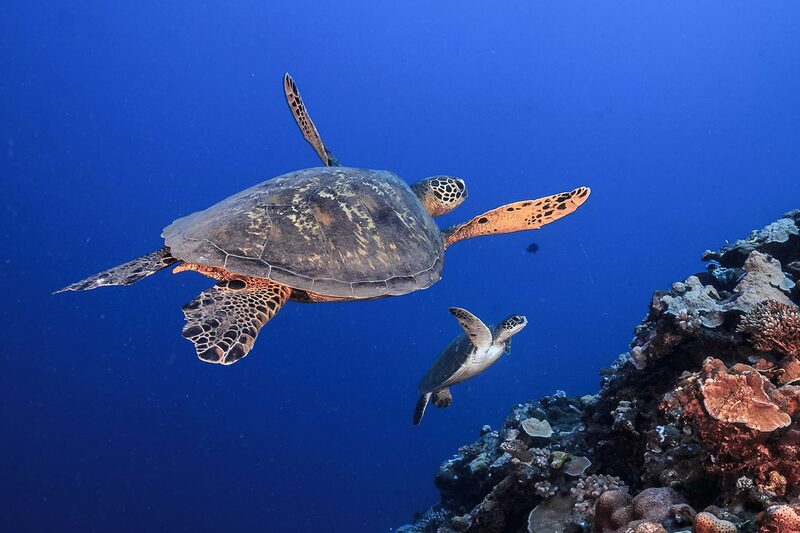 With luck you can encounter the Hawksbill turtle around most all the islands and atolls during your next stay in French Polynesia.